You know that rising, panicky feeling you get when the penny suddenly drops: time is running out, the clock is ticking against you? Well that’s exactly how I felt, last year in December, watching Obama announce on TV that he was going to normalise US relations with Cuba. I knew then that I had to get there quickly, before the island was overrun by hordes of visitors and infested by the usual global, culinary suspects. 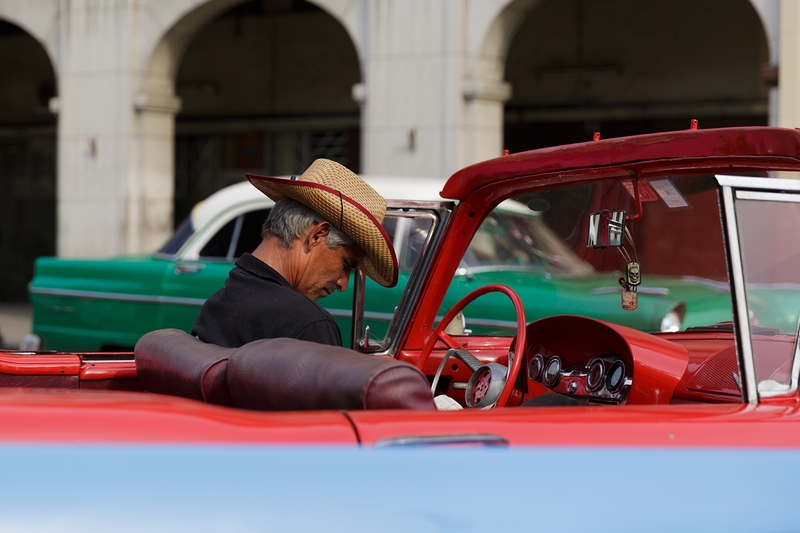 Fast-forward six months and look at me, all-conquering, riding into Havana, languishing in the bouncy, back seat of a powder blue, vintage car. I couldn’t help pinching myself, the vision beyond was film set perfect: sunshine, swag, Chevrolets, and Che. Later, over obligatory mojitos, in a refined, old town bar, my Havana Shangri-La crash-landed. Against the backdrop of an innocuous ballad, a beetroot-faced couple, smarting from the sun, performed an awkward salsa, colliding and giggling; idle waiters nodded in silent encouragement. “The Police arrest us when we walk with foreigners,” Juan our ‘guide’ blurted out unceremoniously, “we are not free, sometimes I hate this place.” He took a frugal sip of his cocktail, replacing the tall glass on the gleaming table, carefully lining up the edge on the embossed coaster. Overhead the ceiling fans whirled reassuringly like the spinning blades of a hovering helicopter safely descending to earth. Breaking from my reverie, I struggled to reconcile the inherent contradiction of Juan’s outburst. Of course we all knew about communism, manifestos, escapees and ration books. But hey, wait a minute, what about unparalleled health-care and education, music, legendary pasión, ballet and boxing? How could one clumsy outburst have the power to dispel the intoxicating version of Cuba libre branded, packaged and exported like a global commodity that some of us had swallowed? And that seemed to be the enduring refrain, living life in the moment, holding out hope, trepidation, restlessness, sometimes even apathy about the terrain ahead. For Habeneros and Cubans in general, freedom, prosperity and unfathomable opportunities beckon within touching distance, but for whom and at what cost in an uncharted Nuevo Cuba.